Allan Zaremberg (left) and Mike Murphy (right) recognize (left to right) Yolanda Carrillo, Lucille Harris and Lydia Zabrycki as the Small Business Advocates of the Year. 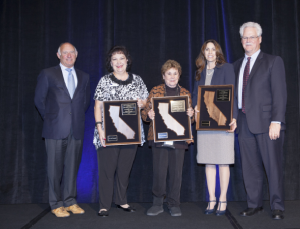 The California Chamber of Commerce honored business executives from Corona, Fresno, and Ripon this week with its 2016 Small Business Advocate of the Year award, recognizing them for outstanding advocacy on behalf of small businesses. 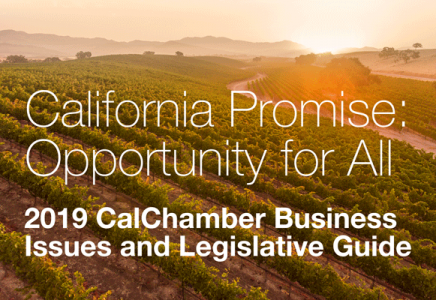 The CalChamber announced the awards in Sacramento on May 17 before more than 200 attendees at the CalChamber Capitol Summit. Lucille Harris, owner, Tuff Boys and W&L Harris Ranches, LLC, Ripon. Carrillo was nominated for the Small Business Advocate of the Year Award by Mark Peabody, chairman of board for the Corona Chamber of Commerce, and Bobby Spiegel, president and CEO of the Corona Chamber. Carrillo has been a leader in Corona and Riverside counties for nearly 20 years as the executive director/CEO for the Corona-Norco Family YMCA. She also serves on the Corona Chamber’s legislative action committee, as well as the Corona Chamber’s board of directors. Through the YMCA, Carrillo has created public and private partnerships, and strong working relationships with the local school district, and the cities of Corona and Norco to privatize delivery of social services at the Y while advocating before the federal and state governments to increase funding available to more than 1,500 families served by the YMCA. Improving services while saving taxpayer dollars is a key priority for the Corona Chamber, and Carrillo has helped save hundreds of thousands of dollars in costs while improving the daily lives of hundreds of families, expanding their access to early education for their children, and improving the job skills necessary to build careers. Carrillo is also credited with federal and state advocacy to keep the NAVSEA Naval Surface Warfare Center open. The base, just north of the city border of Corona, had been on the top of the list for closure in the last two Base Realignment and Closure (BRAC) processes. The facility is responsible for more than $300 million in annual payroll and related contract business activity within the community, and its closure would have caused immediate and devastating job losses in the community. Carrillo revitalized the Navy League community network for the base while advocating before Congress and with the State Military Commission on lobbying trips organized with the chamber. While working to save the base, she also traveled to Washington, D.C. with the Corona Chamber delegation, visiting various congressional offices, from Congressman Ken Calvert to Congressman Darrell Issa and Congressman Mark Takano. Carrillo also has helped streamline the planning process in the city of Corona. As a city planning commissioner, she has been a strong advocate for cutting red tape and streamlining regulation, a key priority for the Corona Chamber. At the federal level, she worked closely with Congressman Ken Calvert (R-Corona) on legislation that helped streamline national environmental regulations and helped Corona complete the groundbreaking SR-91 freeway design-build expansion that is currently underway. In addition to her federal work, Carrillo has worked with the Governor’s Office of Business and Economic Development (GO-Biz) Innovation and Entrepreneurship Director Louis Stewart to bring Corona into the regional I-Hub project area because of the technology firms located in Corona. Her multiple trips to the State Capitol have yielded important developments for women-owned businesses and job training. She has been part of a bipartisan regional coalition involving both Senator Richard Roth (D-Riverside) and Assemblymember Eric Linder (R-Corona) to provide common-sense protections for business owners threatened by nuisance lawsuits under the Americans with Disabilities Act. For more than a decade, Zabrycki has been “one of the most active and passionate volunteer advocates for the business community in Fresno,” the nomination application states. Zabrycki, director of operations and client relations at Precision Civil Engineering, Inc., is “a strong business advocate and a fantastic leader for the chamber and the Fresno community,” wrote Nathan M. Ahle, president/CEO of the Fresno Chamber of Commerce, in his letter of recommendation. 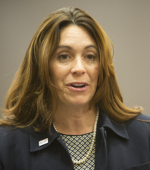 She is a founding member of the chamber’s Government Affairs Committee and serves on the chamber’s board of directors. Zabrycki is part of the Fresno County “One Voice” delegation with representatives from the private sector, public sector and elected officials who are talking to congressional representatives about issues affecting the region. She is active in developing effective coalitions and partnering efforts to advance the interests of the San Joaquin Valley toward an improved business environment as well as serving the interests of local government. Zabrycki oversees the daily operations that take place in Prevision Civil Engineering, coordinating between departments to increase efficiency through organizational strategies, policies and practices while providing leadership. Precision Civil Engineering is a full-service firm based in Fresno that provides civil and traffic engineering, water resources, land surveying, biological and environmental consulting, land use planning and entitlements, and construction management to both public and private clients throughout California. Zabrycki also serves as a director on the Fresno Regional Workforce Investment Board, chairing the business and industry committee. She is the first woman to serve on the Board of the American Council of Engineering Companies Retirement Trust (ACECRT), and a board member and secretary of the San Joaquin Valley ACEC chapter in California. “She is a diligent and passionate advocate for our community, its needs, and most importantly its businesses,” Ahle concluded. 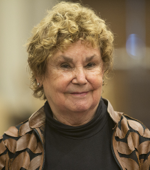 A Manteca native and resident for more than 80 years, Harris has written persuasive letters grabbing the attention of legislators and government agencies to do what she feels will help small businesses in California. She has spearheaded countless grassroots efforts, assisting campaigns and championing for elected offices that have helped represent her communities as well as local businesses. Tuff Boys is a manufacturing facility specializing in the manufacture and leasing of highway trailers. Harris Ranches is devoted to almond growing. Harris’ political advocacy started in the 1960s. Stockton airport was home to a pilot training program, which meant that jumbo jets were circling Manteca every 20 minutes, disrupting classroom instruction for the local schools. Harris contacted airport officials and worked with the community to change the flight patterns. In 1980, Lucille and her husband, Bill, along with their companies, were targets of wrongful and malicious lawsuits drawing them into a complex legal battle. During the course of the litigation, the couple uncovered evidence of fraud and judicial misconduct among certain court offices and some of their own attorneys. Lucille Harris composed her own legal pleadings, and served as her own attorney during a civil trial that lasted five months. She wrote hundreds of letters to public agencies and secured critical support from the Internal Revenue Service. The couple prevailed in their case. In 1988, when business liability premiums skyrocketed by as much as 300%, Lucille Harris joined a grassroots movement for tort reform that demanded an investigation of antitrust violations. In 2008, public litter on farms and ranches through the rural areas surrounding Manteca was yet another of her causes. Farmers were being fined by the county for blight caused by citizens dumping everything from mattresses to stoves to water heaters, dishwashers, TV sets and a whole range of furniture items on farm lands. Following Harris’ letter writing, and well-placed advertisements in the Manteca Bulletin urging the general public to report illegal dumping, the county ceased fining the farmers and agreed to pick up the discarded items under the direction of the board of supervisors. Harris also has been supportive of numerous education programs in Manteca, Lathrop and Ripon for more than 50 years. The closest to her heart has been the Grass Valley Writing Project (GVWP), which offers a summer training program for teachers serving kindergarten through 8th grade students in the Manteca area. Beginning in 2007, Lucille and her husband hosted summer fundraiser dinners in the backyard of their rural ranch home to benefit the literacy program. The dinners have raised more than $10,000 each year and created more public awareness about the GVWP. 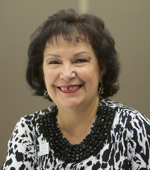 As a member of the Ripon Chamber of Commerce, Lucille Harris “is very proactive and always looking for new ways to empower businesses and drive the local economies,” wrote Kristine Griesheimer, VP branch manager of Oak Valley Community Bank in Ripon. Harris is currently working with the Ripon and Manteca chambers on revitalization efforts for both downtown areas.